﻿Ramadan Day: Calendar, History, Tweets, Facts, Quotes & Activities. 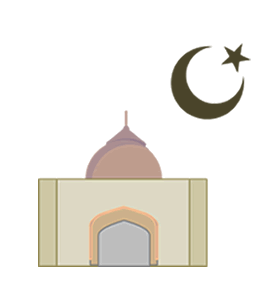 The month of Ramadan begins when the new moon of Ramadan is sighted and ends when the new moon of Sha'ban is sighted. Muslims also believe that devils are chained up during Ramadan. Ramadan comes from the word ramadaa, which means 'sunbaked' in Arabic. This is perhaps a reference to the pangs of hunger Muslims feel when fasting. According to Islamic tradition, menstruating women, women who are experiencing bleeding after giving birth, people who are sick (either with short term or long term illnesses), and travelers are exempt from fasting. Pregnant women also have the option of skipping fasts. In Islamic countries, when Ramadan ends and the crescent moon is first seen, people bang drums and give mighty shouts. According to Sunnah belief, the Prophet Muhammad once said, There is no conceit in fasting. The fast is usually broken in a family setting, where traditional foods are served. Most Muslims begin their meal with a few dates and a glass of milk because the Prophet Muhammad used to do the same. The high sugar content of the dates sends energy to weary fasting Muslim, while the fiber in the dates and the protein in the milk fills them up and prevents nausea. During Ramadan, Muslims congregate every night in the mosque to pray Taraweeh prayers in congregation. In the United States, in between sets of prayers, the Imam gives a brief sermon and encourages people to give to charity. In Islamic countries, the end of the fast is signaled by a loud call to the sunset prayer. Most people eat a small meal, pray at the mosque, and then join their families for a large, festive dinner.